There will be much talk in the next week, especially from the PR flacks, about the 50th Anniversary of the Rolex 24 Hours. Well back in the 60’s Rolex did not sponsor the event and the race was only extended to 24 Hours in 1966, but hey why get in the way of a good headline? Plus it gives the Good Ol’ Boys down on International Speedway Boulevard an excuse to repeat the celebrations in four years and who wants to be a party pooper? 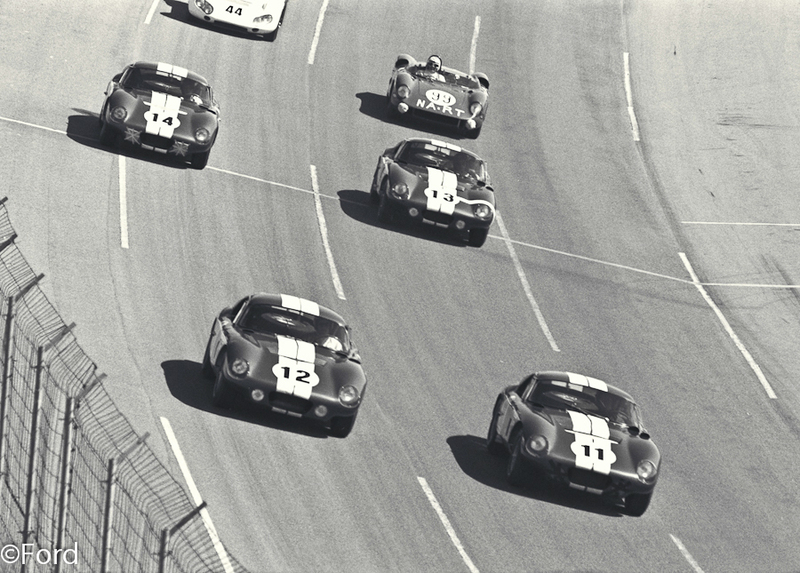 In 1965 the sportscar endurance event held at Daytona International Speedway was over a distance of 2,000 kilometres or 327 laps. It took over 12 hours for the winner, a Ford GT40 driven by Ken Miles and Lloyd Ruby, to complete the distance. In 1965 the real success story for the Ford steamroller was that of the Shelby Daytona Cobra Coupés on their way to the FIA GT Manufacturer’s Championship. The opening salvo in that campaign was at Daytona and here are the four cars on the opening lap, flying in formation. #13 (CSX 2299) would finish second overall and top of the GT class with Jo Schlesser and Hal Keck on driving duties. This car was perhaps the most successful Daytona Cobra of them all, with class wins at Le Mans, Goodwood, Sebring and Oulton Park to add to the win on the banking in Florida. This entry was posted in Nostalgia, Notes from the Cellar, Rare and Interesting, Real Men and tagged Daytona International Speedway, Shelby Daytona Cobra on January 22, 2012 by John Brooks.